A quick disclaimer: Smoothies, in general, are healthy any way you eat them! If you’re consuming a smoothie chances are you’re doing something great for your body. This post just shows you how little changes can potentially create big changes in your health! I love smoothies. I drink them all the time, they are easy, fast, and delicious. But lately I’ve been into “smoothie bowls” which is basically a smoothie eaten out of a bowl instead of a cup or glass. Here are some reasons why you might want to upgrade your smoothie to a smoothie bowl! 1) It aids digestion. Have you ever heard the phrase “remember to chew your smoothie?” Chewing food does more than just break it down into smaller pieces; it also covers our food in saliva, which contains enzymes that assist with the digestive process. Sometimes when we drink smoothies quickly out of a straw or a glass, we may not be activating the salivary enzymes needed to fully digest it. What does this have to do with a smoothie bowl? When we eat a smoothie bowl we use a spoon, which makes us more likely to chew. We can also add toppings (like nuts, fruit, seeds, etc.) so that we need to chew between bites! Problem solved! 2) No bloating. Do you drink your smoothies through a straw? I do, I love them, and I use the compostable or reusable ones whenever I can. There is a downside to straws though—all that extra air in the top of a straw can end up in your stomach! 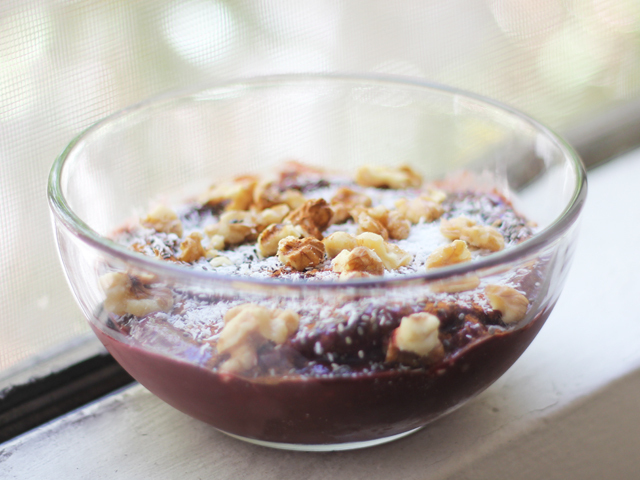 With a smoothie bowl you eat the smoothie with a spoon, so no bloating problems. 3) No lip lines or facial wrinkles. Have you ever heard that puckering your lips repeatedly (with a cigarette, straw, etc.) contributes to wrinkles around your lips? I’ve done some research and it seems not all dermatologists are convinced, but many say yes, sipping a straw can lead to wrinkles around the mouth from the repetitive movement of pursing the lips. Just to be safe: no straw = no lip wrinkles. 4) Additional nutrients. With a smoothie bowl it is easy and fun to add more toppings! I usually use chopped walnuts, chia seeds, extra fruit, shredded raw coconut, and cinnamon (as pictured above). All these extra toppings not only make your breakfast pretty and Pinterest worthy, but they also provide additional nutrients for your body. Variety is important for good health! 5) More satisfaction. Where do you drink your smoothies? On the go, in the car, while distracted at your desk? Many people do not think of smoothies as a “meal,” I’d say most people consider it a “drink.” If someone asks you what you had for lunch, you might be inclined to say “oh, I just had a smoothie.” But a smoothie BOWL is a meal, you sit at a table, look at the pretty bowl full of goodness (see #4 above) and eat it with a spoon similar to how you would with oatmeal or cereal. I feel more satisfied and full after my smoothie bowls! So how do you make a smoothie bowl? Whip up a smoothie in a blender and pour it in a bowl instead of a drinking glass. I tend to make my “smoothie bowl smoothies” thicker by using less liquid and more frozen fruit or ice. This makes the texture more similar to that of ice cream rather than a liquid. Top with your favorite toppings such as coconut and walnuts! So next time you make a smoothie, try pouring it in a bowl instead of a glass! It may sound ridiculous, but it might lead to a lot of benefits for you. Try it out! If you haven’t subscribed to my newsletter, sign up now and you’ll receive my newest smoothie recipes and other health tips! This entry was posted in Health and tagged beauty, blender, bloating, breakfast, dessert, digestion, healthy, nutrients, raw, smoothie, smoothie bowl, snack, toppings, treat, vegan, vitamix, weight loss, wrinkles.